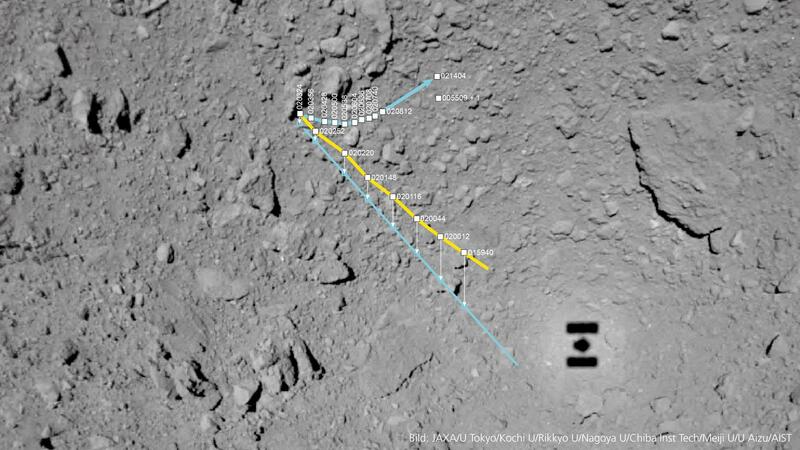 Explanation: Two small robots have begun hopping around the surface of asteroid Ryugu. The rovers, each the size of a small frying pan, move around the low gravity of kilometer-sized 162173 Ryugu by hopping, staying aloft for about 15 minutes and typically landing again several meters away. On Saturday, Rover 1A returned an early picture of its new home world, on the left, during one of its first hops. On Friday, lander MINERVA-II-1 detached from its mothership Hayabusa2, dropped Rovers 1A and 1B, and then landed on Ryugu. Studying Ryugu could tell humanity not only about Ryugu's surface and interior, but about what materials were available in the early Solar System for the development of life. Two more hopping rovers are planned for release, and Hayabusa2 itself is scheduled to collect a surface sample from Ryugu and return it to Earth for detailed analysis before 2021. Today's APOD reminds me of July 20, 1969, when Neil Armstrong and Buzz Aldrin became the first human beings to land on the Moon. I remember seeing what I guess was Neil Armstrong filming Buzz Aldrin as he descended from the lunar module to set foot on the Moon. What I really remember was that the transmission quality was beyond awful, and I had no idea what I was seeing and hearing. Okay, my English was lousy back in 1969, but the sound quality, too, was horrendous. "One small step for a man, but a giant leap for mankind" - say that again, Neil, OK? In later years, when so many people have begun questioning the Moon landing, I have come to think of the terrible quality of the transmission as one brilliant piece of evidence that the Moon landing was for real. Because if Hollywood had staged the whole thing, there is no way they would have allowed a fake Moon landing to look and sound so bad! So, back to today's APOD. It looks pretty terrible to me. So I guess that, given what else we have reason to think we know about the Hayabusa2 mission to Asteroid Ryugu, the terrible quality of the picture suggests that the scene "depicted" - or something - is authentic. The image quality may be at least corollary evidence that Rover 1A really made it to this asteroid and is really hopping around there, while its asteroid visitor buddy (the Buzz Aldrin rover? Rover 1B?) is trying and failing to take a good picture of its rover mate! Hopefully it has faster exposures? I hope for some good images...maybe not on a hop? But hey...it is on an Asteroid!!!! And a great job!!! I don't think the quality of the photo is so bad. If you turn the picture 90 degrees to the left and cut out only the middle half, you get a good impression of the surface. The blur nicely reflects the dynamics of the robot jumping around. Looking for details of the landers/rovers, and especially how they 'hopped', I found this excellent film from the German partners of Japan in this project. I shows how the MASCOT lander moves, so I assume that the MINERVA rovers do likewise. (hence: Minerva was NOT seeing her own shadow) so an annotated version would have been nice. On a more serious note, I think this image is really cool. I have to admit that whenever I think of rovers on an asteroid, I get this image in my head of something like The Little Prince. Today's APOD reminds me of this song. Now that I've looked at it a bit more, I like it better than I did at first. Yes, it is cool. Just looking at that tiny, tiny world of an asteroid is pretty incredible! Imagine hopping about on that asteroid, which has hardly any gravity. Don't kick off too hard, or you will be lost in space! Imagine hopping about on that asteroid, which has hardly any gravity. Don't kick off too hard, or you will be lost in space! On Earth a vertical leap of 38 cm/s will only take one a mere 0.75 cm [=(38 cm/s)2/(2 x 981 cm/s2)] into the air. Indeed...small creepy crawlies who can't jump are out of luck on Ryugu. and hence would be able to achieve escape velocity on Ryugu. Well… it is pretty interesting to do a few calculations regarding Ryugu's mass, surface gravity, height of hops, and all that. That's brilliantly slow! A couple of inches a second? Wow. And it stays aloft for 15 minutes no less!!! Gives new meaning to “feeble gravity”. And the ratio 'atween FCENTRIPETAL and GSURFACE is 4.92! Meaning that surface gravity is only about 5× greater than the centripetal force that would otherwise sling all the surface stuff forever off into space. Close shave! And that's about that, from a calculations perspective. Totally fake. It's actually the area behind the Universal Studio. Just some greenscreen and filters added. If you go there and look now you can see how good they were in hiding their tracks after they finished filming some months ago. As nothing had happened. Evil geniuses. So, this is an intentionally blurry image, because the point of posting this one was not to get a good look at the asteroid. The point of it, I surmise, was to evidence the "hop" of the Minerva probe. Last edited by MarkBour on Mon Sep 24, 2018 8:57 pm, edited 1 time in total. Wow, impressive efficiency in their use of lyrics. By making the photo blurry, a casual observer will get the opinion that the U.S. is still far ahead of the rest of the world in science and technology. That might make the Japanese hopping mad .. but .. they'll take to their hops infused drinks and smile. I don't think the quality of the photo is so bad. If you turn the picture 90 degrees to the left and cut out only the middle half, you get a good impression of the surface. The blur nicely reflects the dynamics of the robot jumping around. If anyone would know how to hop, it would be you, Neuf!! "I have seen it many times. I have had many friends involved in this stuff. It's called flipping and it almost ought to be illegal."